Royal Chundu, the first Relaix Chateaux property in Zambia, is 14 suites of majestic and secluded opulence nestled on the Zambian bank of the immense Zambezi River. Here, upstream of the Victoria Falls, the river is a wide and tranquil elixir that supports a myriad of bird, fish, mammal and plant life. Elephants graze the banks and islands while tiger fish dart through the water after prey. Royal Chundu represents a commitment to unbridled luxury in the wild of Africa and the constant support of local communities. River Lodge is the majestic hub of Royal Chundu. 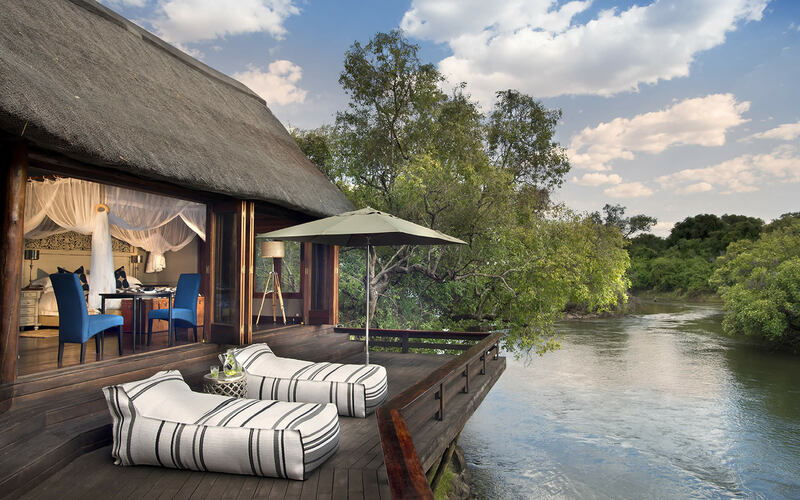 The double volume thatch main area looks out across the main Zambezi channel onto the distant banks of Zimbabwe. It feels as if nature birthed this Zambian gem, so seamlessly does it fit into the vegetation around it. The sumptuous sitting rooms are softly lit by crystal yellow glowing chandeliers. The acres of wooden decking, deep cool pool and serene atmosphere offer endless delightful spaces for rest and reflection. The fabulously stocked wine cellar and library full of leather-bound volumes offer sophisticated retreats at night or when the weather closes in. The ten superbly decorated and sublimely comfortable suites are spacious tributes to the Zambezi and the warmth of the local people. They offer complete privacy indoors and outside on the generous private decks. The river meanders on its timeless journey while hippos surface in the shallows, bushbuck browse in the verdant vegetation and, if you are lucky, an elephant swims across the main channel as you lie on a chaise longue in astonishment at the engulfing splendour. Island lodge is Royal Chundu’s premier camp with just four superb suites secluded on a private island, surrounded by easy channels and shaded by ancient baobabs. Each suite is a testament to the romance of Africa. The highlight of your private deck is the open-air bath. The acme of rejuvenation is to lie in the tub suspended over the river while inhaling the soft, sweet scent of the river. If you are not watching the action in the water from the extra length king size bed, then you might be sipping a gin and tonic from the shaded basket chair on the deck or lazing in a tender lounge armchair. The entire front of the suite is fronted with glass concertina doors which means you are constantly thrilled by the wildness of the Zambezi while recharging in the lap of profound luxury. The main area boasts two opulent lounges, a dining deck slung out under the star-sprayed African sky, an intimate boma and an infinity pool to quench the heat of the day and help you empathise with the hippo grunting with satisfaction in the river below. Children of all ages are welcome at Royal Chundu and there is an excellent children’s programme where budding young naturalists can have wilderness fun in complete safety under the watchful gaze of the high-skilled Royal Chundu Staff. While your spirit is being recharged with a spa treatment or a snooze on the deck, your kids will be treasure hunting, catching fish, cooking, cruising on the river and visiting local villages. There is a wealth of excitement to be had at Royal Chundu both on the property and in the wider magnificence of the Zambezi. If you are looking to unwind and rejuvenate your soul, then a treatment from one of Royal Chundu’s world-beating therapists, either in the tranquillity of the spa or in the seclusion and of your suite deck, will fill you with a sense of relaxation, gratitude and joy. Expeditions onto the grand Zambezi include canoeing adventures with highly-skilled guides and tiger fishing trips with knowledgeable locals who delight in helping you master the art of this unique fishing discipline. Away from the river, Royal Chundu is proud to offer tours to two of the local villages that the lodge supports through conservation and ecotourism initiatives. Away from Royal Chundu there is any number of exciting adventures to be experienced. An expedition across the border into Botswana’s world-famous Chobe National Park is an excellent safari option. A short drive takes you across the iconic Victoria Falls Bridge into the eponymous historic town where the rainforest walk, in the spray of the cascading water, brings you up close to the awesome power and scale of the falls. You might choose to fly over the falls in a helicopter or an expertly-piloted microlight. If you have a desire for wild adventure, then white water rafting over the thundering rapids of the Zambezi – where the river is squeezed through an impossibly magnificent gorge beneath the falls – will leave you wide-eyed and smiling. Plummeting from the Victoria Falls Bridge on the end of a bungee rope or screaming across the gorge on a zip line are two other activities to make the heart race. No matter what adventure and sights you have experienced during the day, a gentle sunset cruise onto the river from Royal Chundu will allow you time for reflection. The soothing waters laps against the boat, you sip your favourite sundowner, the water birds make their languid way to roost, an elephant bull squirts mud onto his back and the sun, which is somehow bigger here, disappears in a blaze of gold and red. The simplest way to get to epic Royal Chundu is to fly into Livingstone International Airport. There are daily flights from Johannesburg on three different airlines. If you have been on safari in the greater Kruger area, there are direct flights into Livingstone from Kruger Mpumalanga International Airport. Royal Chundu staff will collect you from Livingstone and after 50 scenic and air-conditioned minutes on the road, you will arrive in paradise. An expert from Iconic Africa will arrange all this for you. What about the rest of southern Africa? Southern Africa is awash with adventures and epic places. Iconic Africa suggests that you combine your trip to Royal Chundu with one or two other southern African delights. If you are travelling with the family, you might like to travel to cosmopolitan Cape Town where there is excitement and beauty for all ages. 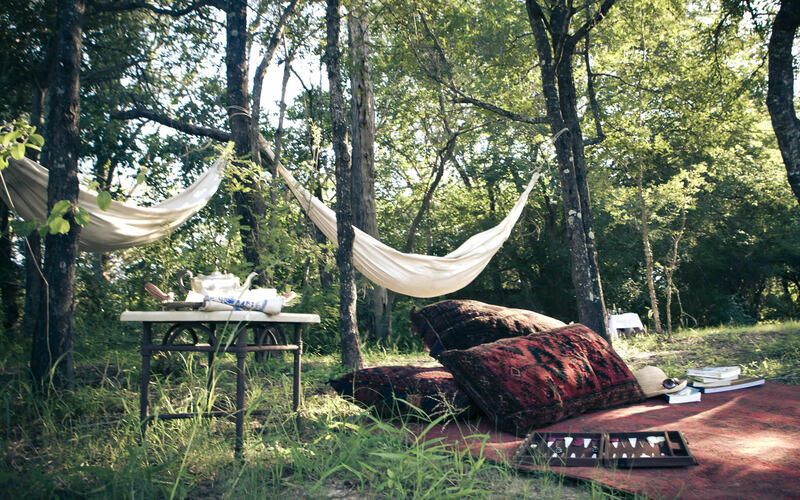 The malaria free Madikwe Game Reserve offers spectacular luxury family safaris. If its romance you want, then a secluded island off the coast of Mozambique is an excellent option, especially when combined with a safari in the greater Kruger National Park. One of Iconic Africa’s expert travel consultants will help you craft the African holiday of a lifetime to suit your needs. 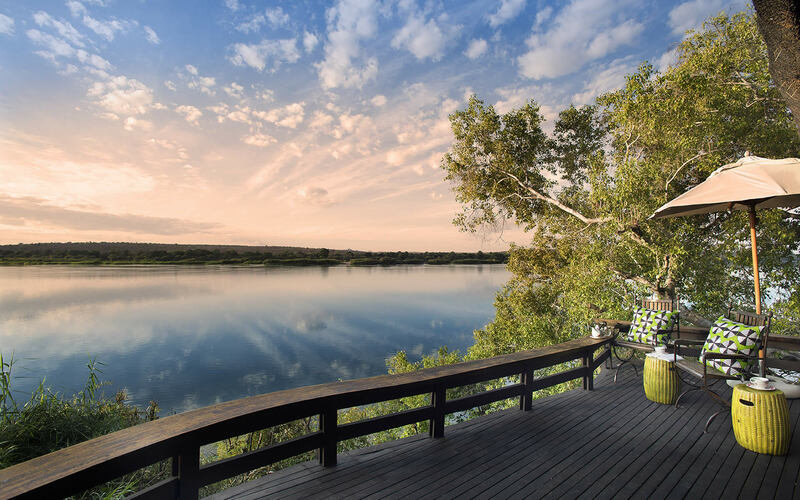 Royal Chundu offers Relais Chateaux opulence, comfort, seclusion and service suspended over the iconic Zambezi River where wilderness, history and adventure combine to conjure an atmosphere of absolute awe. Iconic Africa can’t recommend this property enough – one of our passionate consultants is standing by to tell you all about this African icon. The first Relaix Chateaux property in Zambia. Upstream of the Falls, the river is wide and tranquil and supports a myriad of bird, fish, mammal life. A commitment to unbridled luxury. During the summer months temperatures are high with short sharp thunderstorms. High flow occurs between February and July, offering the most awe-inspiring views. Victoria Falls or what the locals call “the smoke that thunders” is at its fullest and most impressive between May and June. The full curtain of water stretches the whole width of the Zambezi. The sheer volume of water is jaw-stopping and the thunderous roar and fine mist reaches for miles. Do be careful with your cameras in the mist of the rainforest… you may need to purchase a poncho to keep it dry. This transitional flow can also be an incredible time to visit Victoria Falls. The lower water volume and less mist allows for breathtaking views and incredible rafting conditions. White-water rafting, definitely something for the adventurers bucket-list! Whether you are bravely paddling through a rapid, holding on to the rope for dear life or bouncing around in the white water this is an experience to remember. Flow is at its lowest in the dry season resulting in narrower streams of water flowing over the rock wall. Although the actual falls may not be as remarkable, tourists are able to get closer to the edge and visibility is improved. As a result you are likely to get much better photos than during high flow. If you are an adrenalin junkie… this is a great time to live on the edge and take a refreshing yet heart-stopping swim in Devil’s Pool. The sparse vegetation also makes wildlife spotting much easier and game drives far more thrilling. Read more about when the best time to visit Victoria Falls is. Royal Chundu is an African commitment by the Aponte family to deliver the most luxurious experience in remote Africa. There is truly no more luxurious a location from which to access Victoria Falls. Do not hesitate in contacting one of our African travel experts and begin your journey to Africa with us now!